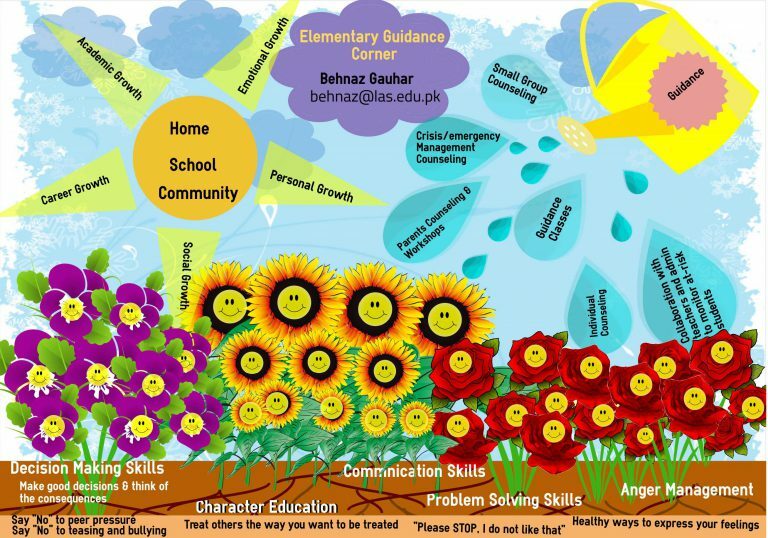 Welcome to the Lahore American School elementary guidance web page! Parents and students are encouraged to contact the elementary counselor to discuss any concerns as we believe the issues are best resolved when tackled and dealt with quickly. Behnaz Gauhar is the Elementary Guidance Counselor at the Lahore American School. She has been a part of the LAS family for the past sixteen years, having worked as the Elementary and Middle school Guidance Counselor. After completing her Bachelors (BSc) in Psychology, Behnaz pursued her Masters in Education (M.Ed.) from Utah State University. Behnaz started her career at the Educational Experimental Unit in Logan, Utah. In Pakistan she worked at the Child Psychiatric Unit at the Mayo Hospital and taught MPhil classes for the Clinical Psychology program at the Punjab University. In 2007, Behnaz successfully participated in the Summer Institution on Resiliency Based Interventions for Emotional & Behavioral Issues held by the Association for the Advancement of International Education (AAIE) in Seattle, Washington. Behnaz also completed her certification in Autism Studies for Professionals from Antioch University, Santa Barbara in 2011. In July 2018, Behnaz participated in the annual American School Counseling Association (ASCA) Conference titled Students, Transitions, Achievement, Retention & Success (STARS) held in Los Angeles.